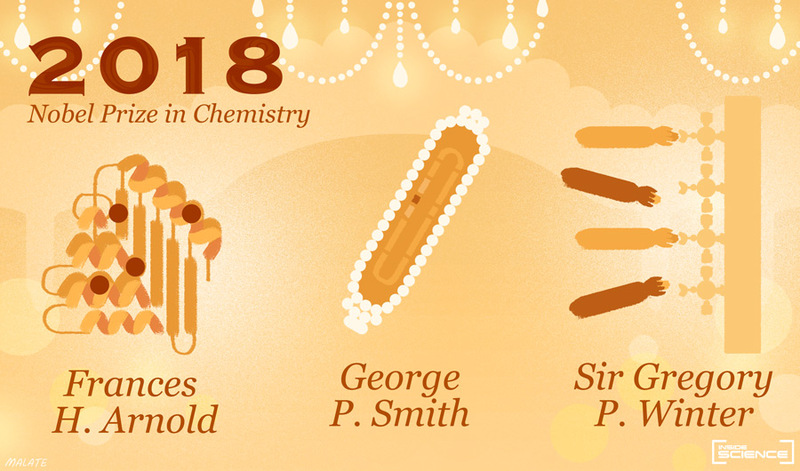 The 2018 Nobel Prize in chemistry will go to Frances H. Arnold, George P. Smith and Sir Gregory P. Winter for research on enzymes, peptides and antibodies. (Inside Science) -- The 2018 Nobel Prize in chemistry has been awarded to three scientists who have used evolution to incite a chemical revolution, with the hopes of improving drug discovery and reducing the use of harsh chemicals in industrial processes. Half of the prize goes to Frances H. Arnold from the California Institute of Technology and the other half is shared between George P. Smith from the University of Missouri and Sir Gregory P. Winter from the University of Cambridge in the U.K.
For thousands of years, humans have been selectively breeding crops and animals to tinker with the genetic makeup of their future generations in humankind’s favor. The three new laureates have used modern molecular-based methods to re-create this process in the laboratory and therefore speed the process up considerably. “This year’s prize in chemistry rewards a revolution based on evolution. Our laureates have applied the principles of Darwin in test tubes and used this approach to develop new types of chemicals for the greatest benefit of humankind,” said Claes Gustafsson, chairman of the Nobel committee for chemistry 2018 and a professor at the University of Gothenburg, in Sweden. The scientists have pioneered techniques in a process known as “directed evolution,” which creates new proteins by using processes which simulate natural selection. A gene is re-created many, many times, which creates a library of variants that are then used inside test tube organisms to see which variant is the best. “Our laureates this year have been able to direct evolution, to steer it, which has led to new chemicals that can be used in everything from environmentally friendly detergents to the creation of new biofuels and pharmaceuticals,” said Gustafsson. This is only the fifth time a woman has received the chemistry award, which was announced by Goran K. Hansson, secretary general of the Royal Swedish Academy of Sciences. The three winners will share a prize of 9.0 million Swedish kronor (about $1 million).